Over the past few weeks we have been covering different free utilities to help in keeping your computing experience secure and bug free. 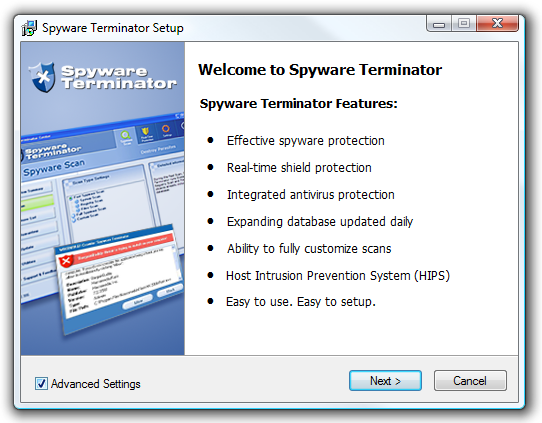 Continuing with our Secure Computing series, today we will take a look at the Anti-Spyware utility Spyware Terminator. During installation, notice you can check Advanced Settings which will allow for more options during set up. 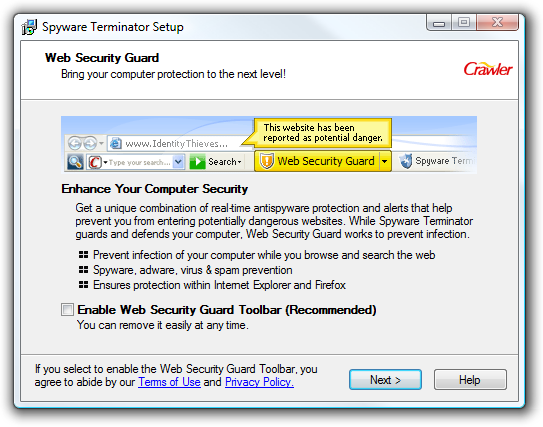 Another screen to mention during install is the Web Security Guard Toolbar. As you know I am not a fan of toolbars at all so I uncheck this. It does add extra protection while surfing the web, but both Internet Explorer 7 and Firefox 3 offer pretty decent protection on their own. 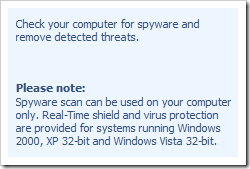 Unfortunately for those of you running a 64bit Windows system, not all Spyware Terminator features will work. 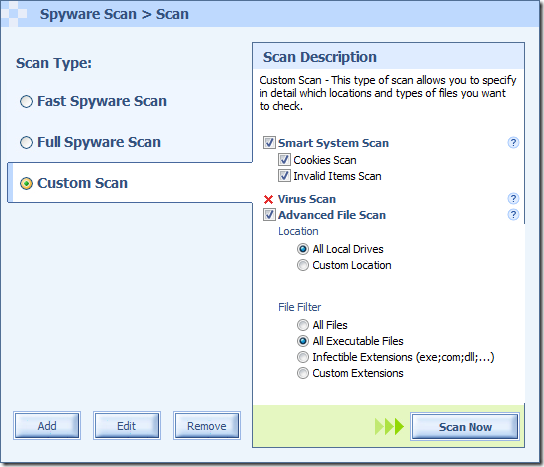 Only Spyware scans and elimination are possible. 32bit Vista and XP users get the addition of Real-Time Protection. Make sure and update the Spyware database right away by hitting the Update button. If you only want to update the database put a check in the box next to “Update Database Only”. This is a good choice to scan objects quickly, however you might want to uncheck it periodically to find new application updates also. There are three scan types available Fast, Full, and Custom. Fast will only check your system, registry, and executable files. While Full scans everything and Custom allows you to choose. 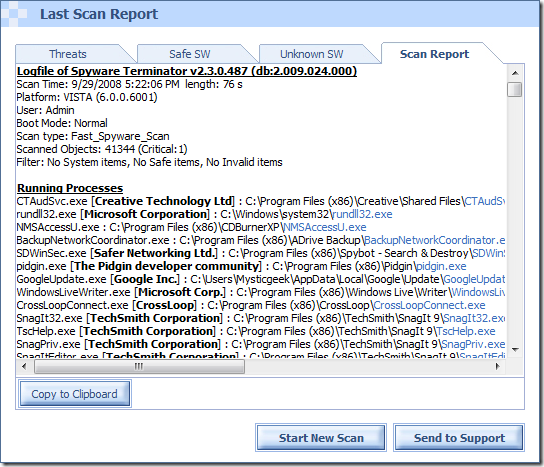 Scheduling scans is possible with Spyware Terminator. 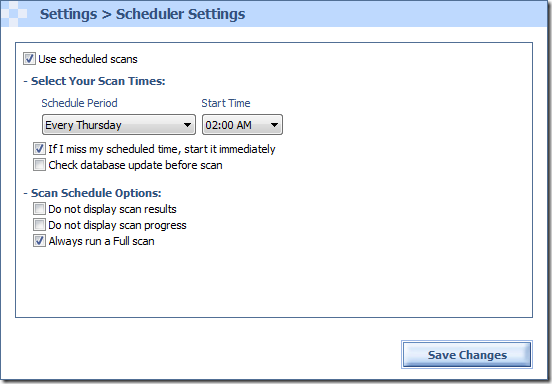 Just select the day and time an scan options and save. 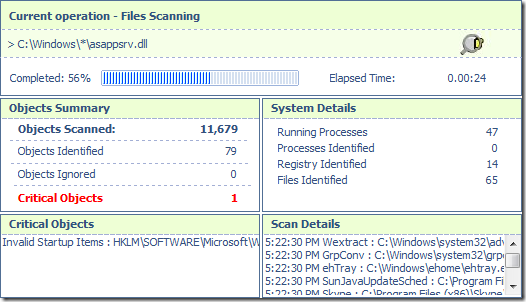 Although the Fast Scan option is a quick easy solution but only scans executable files. Scheduling a full scan will give you more piece of mind. Scan Progress is shown while scanning is taking place. 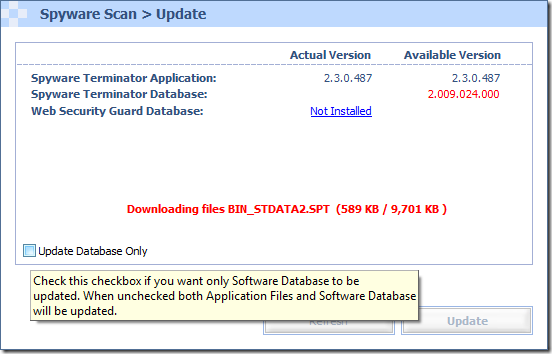 You can pause or abort a scan at any time while it is running. After a scan has completed you get report in the user interface. This is handy as I have found a few false positives. There are millions of software applications out there and no program will report them all correctly. 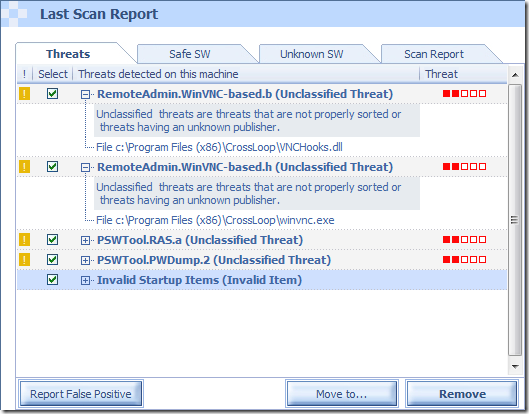 Make sure to check this out and report false positives to ensure a better database. 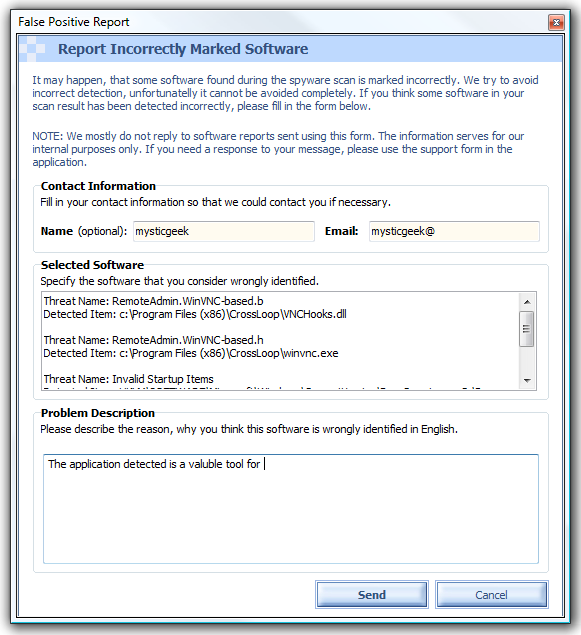 When reporting a false positive another screen comes up with the detections. Fill out contact info if you want and write a brief description on why the detection is false then send it off. 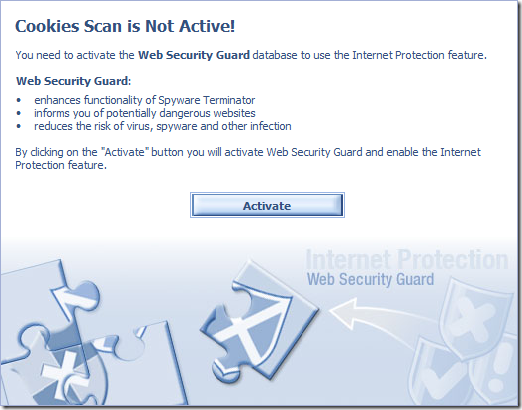 If you look in the Internet Protection session you might see this notification screen. Remember we selected not to install the Web toolbar and cookies will not be scanned. There is a nice ability to keep track of all scans by copying the results to your clipboard and past into documentation. This comes in extremely handy if a machine is getting multiple instances of spyware. 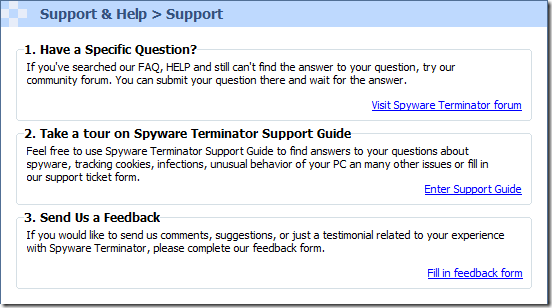 One final thing to mention is Spyware Terminator includes a great Help & Support Center. Our series is wrapping up, and we’ll post our conclusions and the best tips for secure computing in an upcoming article.